}); relaxed and healthy: Blood Pressure! What does the numbers mean? Blood Pressure! What does the numbers mean? Your ideal blood pressure should be below 120/80 mm Hg but what does it means? The first or top number is your systolic pressure and the bottom or second number is your diastolic pressure. So know you are probable wondering what systolic and diastolic pressure is. Systolic pressure measure the pressure in the arteries when the heart beats and diastolic pressure measure the pressure in the arteries between heartbeats. Your blood pressure rises and fall with each heartbeat. How do you know if you have Hypertension? When your blood pressure readings are in the Pre-hypertension range your doctor will recommend a balanced diet and regular exercise to get you back into the normal range. 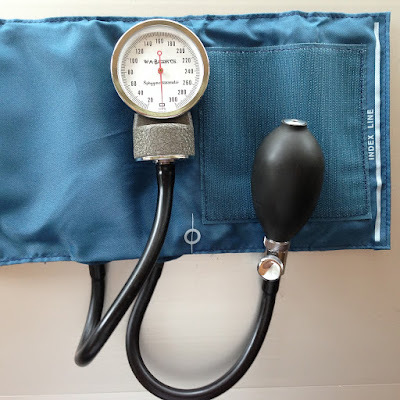 Once you blood pressure jumps over into the Hypertension range your doctor will prescribe medication along with prper diet and regular exercise to help bring it back into the normal range. How do you prevent hypertension? Hypertension is a lifestyle disease, which simple means based how you live your life you will or will not have this disease. Living an active lifestyle and having a healthy diet will facilitate a lower blood pressure and a overall healthier lifestyle. I suffer from high blood pressure (hypertension) therefore maintain a healthy diet and I exercise regular to help keep me in the healthy range. Reducing my sodium intake and becoming very active was what helped me to get it back into the normal range. Do you suffer from hypertension? What do you do to maintain a normal blood pressure? Motivation: What is your Legacy?